Become a Member of the WildmanSteve Radio Family! WildmanSteve Radio is a listener-supported station, and that's why you don't hear any annoying commercials in our programming. By donating, you become a member of the family and receive access to our download page, where you'll be able to listen to or download exclusive live performances from our studios! When you donate at larger levels, you get some pretty cool stuff in addition to this special access as our thanks to you. Get our email newsletter and lifetime access to our DOWNLOAD page, where you'll be able to listen to or download exclusive live performances from the WildmanSteve Radio studios!! 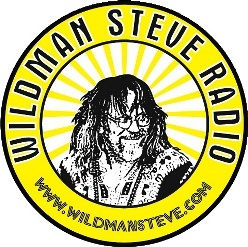 Get our email newsletter, lifetime access to our DOWNLOAD page, and two WildmanSteve Radio stickers!! Get our email newsletter, lifetime access to our DOWNLOAD page, two WildmanSteve Radio stickers, and two of our cool WildmanSteve Radio fans!! Get our email newsletter, lifetime access to our DOWNLOAD page, two WildmanSteve Radio stickers, two WildmanSteve Radio fans and a WildmanSteve Radio T-shirt! Get our email newsletter, lifetime access to our DOWNLOAD page, two WildmanSteve Radio stickers, two WildmanSteve Radio fans, a WildmanSteve Radio T-shirt AND we'll send you a surprise CD of one of the artists we play every month for a year! NEW! JOIN or CONTINUE MEMBERSHIP IN THE CD of the MONTH CLUB!! GET a FREE CD from our collection EVERY MONTH FOR A YEAR!! !